I’m an only child, so novels that involve multiple generations of families converging on a single location for an extended period of time always fascinate me, and that’s one of the reasons I requested this novel from NetGalley. The other is that I love ‘beach’ books, and I love all the authors referenced in the description. This novel was both gripping and poignant – it opens with Maggie opening the house for the summer, and finding out that her recently-divorced father is slipping a bit – not taking care of himself – perhaps becoming unable to care for himself. The other two sisters are a bit less defined but this book is the classic example of three sisters forming a sort of mirror of the larger family, reflective, but also distinct, as each has her own angle, her own perspective. I really liked that each sister had her own arc, and that their kids were allowed to be fully-fledged characters. I thought author Wendy Francis did a great job at creating dimensional characters who felt like people I might know. Goes well with egg salad sandwiches and fresh lemonade. 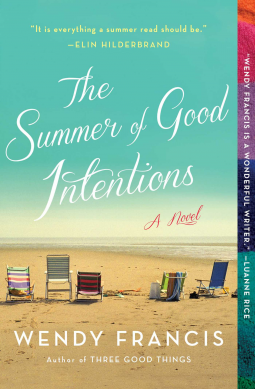 The Summer of Good Intentions, by Wendy Francis #quickreview #netgalley by Melissa Bartell is licensed under a Creative Commons Attribution-NonCommercial-ShareAlike 4.0 International License.